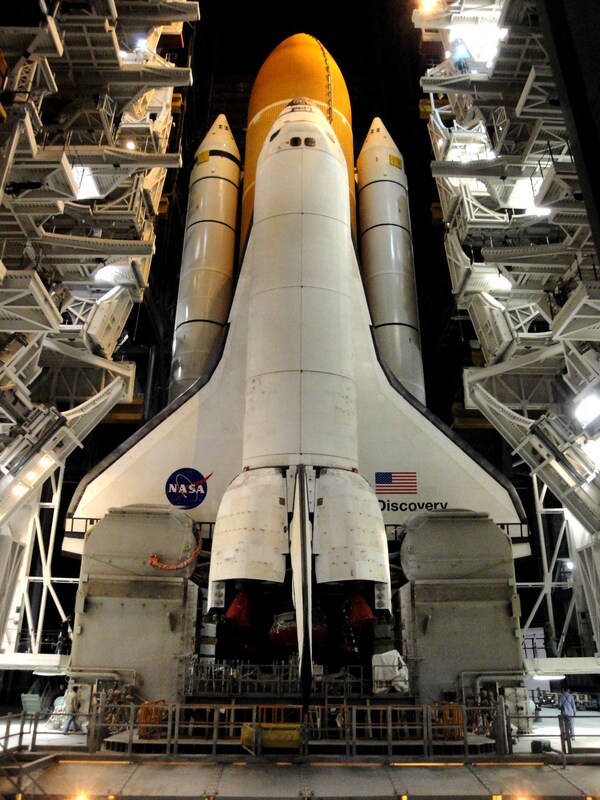 UPDATE == March 28, 2011 … NASA now says, whether Congress funds the flight or not, that NASA will find the money to fly one additional shuttle mission to the International Space Station (ISS) after STS-134’s scheduled launch in April 2011..
What may be the final launch in the American shuttle program moved a step closer overnight, March 10-11, 2011, when Endeavour was moved from the Vehicle Assembly Building to the launch pad. 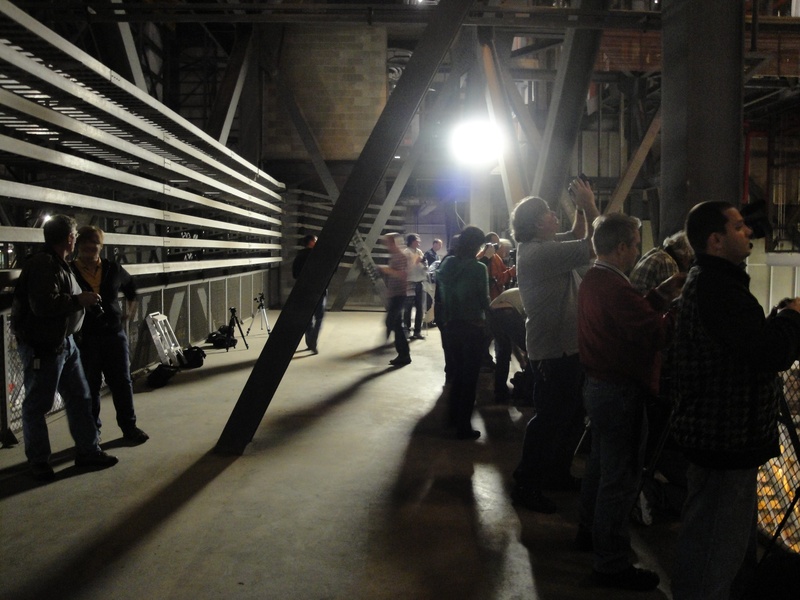 About sixty reporters and photographers covered the event from the 5th and 16th floors of the VAB, and from the press site across the street. 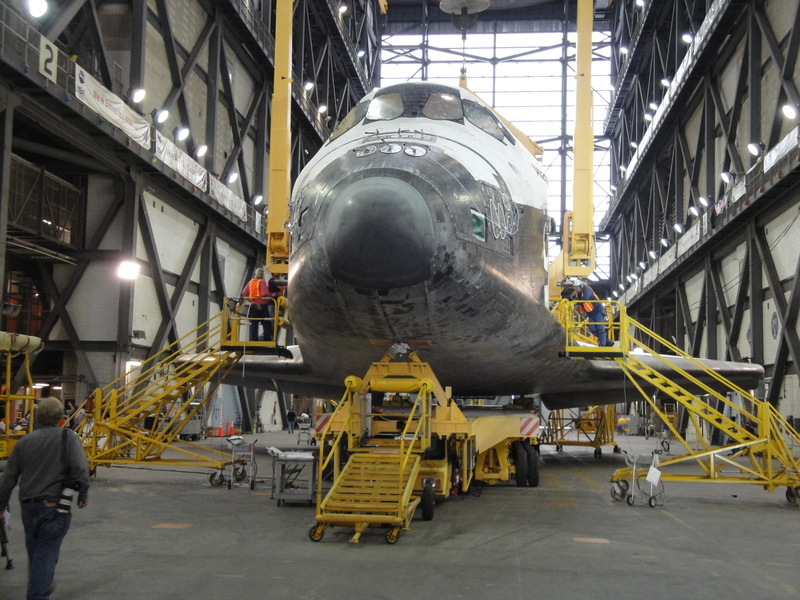 Endeavour departed from the bay on the far right of the VAB about 8 pm; Discovery departed in January for its final flight from the VAB other bay. This photo was taken at 10:18 pm, March 10, 2011. 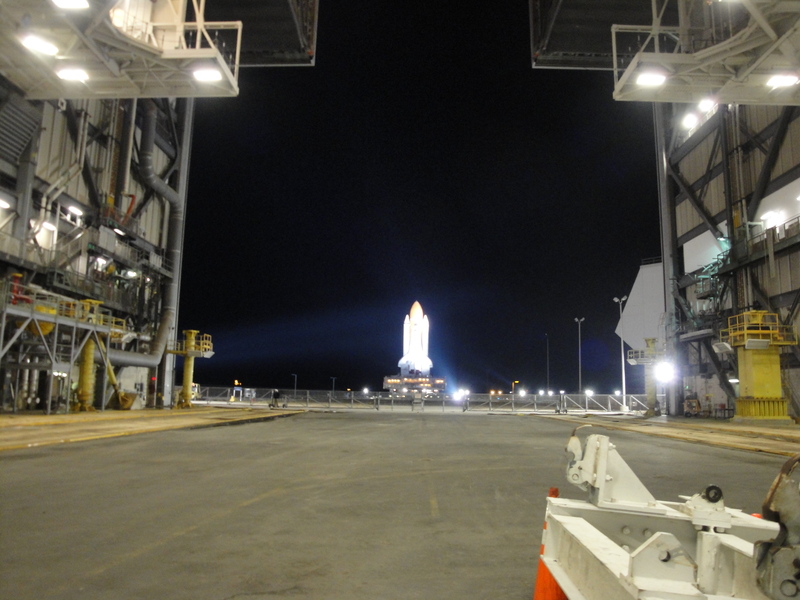 Endeavour is out of frame to the right, slowly progressing toward Pad 39-A where it was scheduled to arrive about 6 hours after leaving the VAB, or roughly about 2 am. photograph by Carol Anne Swagler on behalf of The Grove Sun Daily / photo © 2011 Seine/Harbour® Productions, Studio City, California. 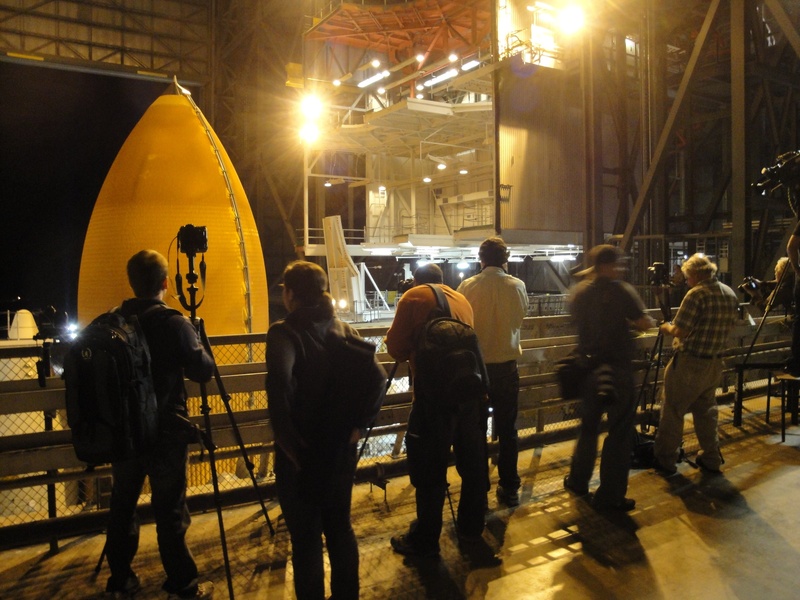 NASA invited selected members of the press to record the Roll Out of the Shuttle Discovery from the Vehicle Assembly Building to Launch Pad 39A on the night of January 31, 2011. 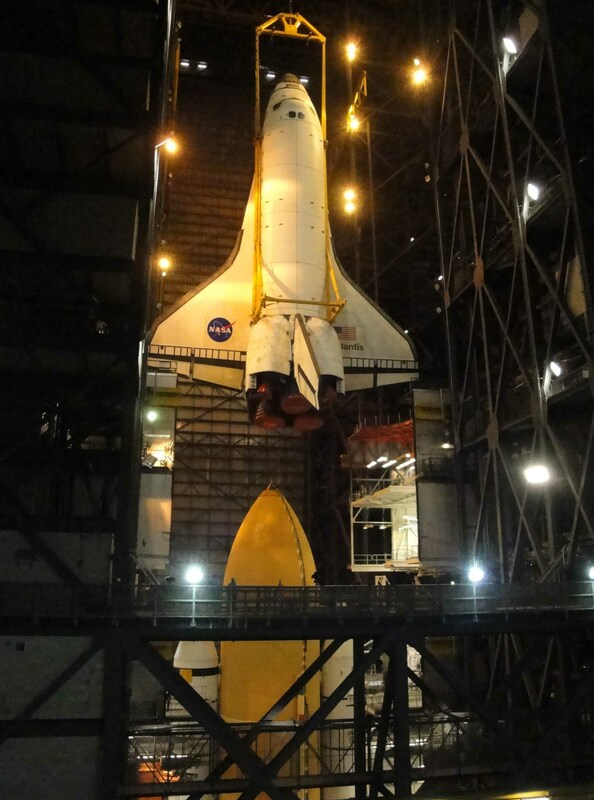 This is a series of photos taken that evening, to include a small selection of a series taken on the 5th and 16th floors inside the VAB. The Media Center at Kennedy Space Center, Florida. This is workspace and a general clearing house of data and information for the media. 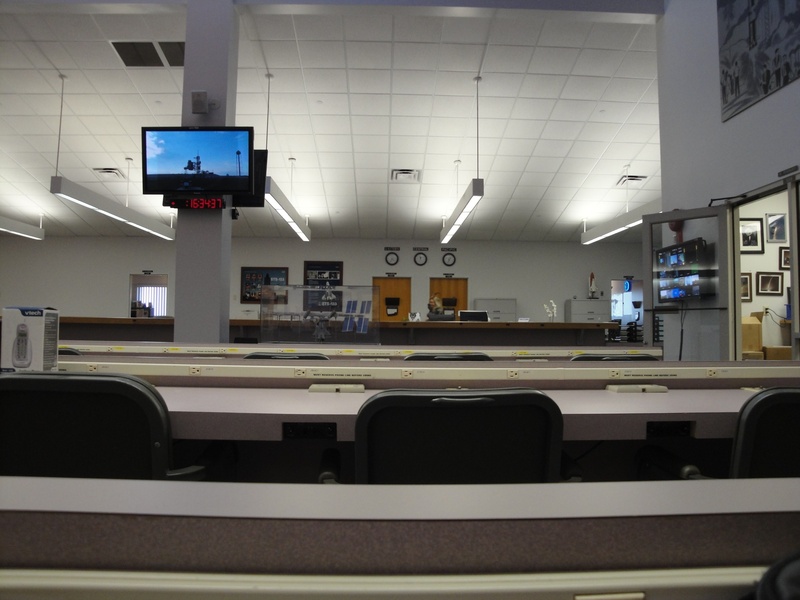 The Media Center is adjacent to a briefing room where commonly joint news conferences are held linking other NASA facilities, such as Johnson Space Center in Houston. 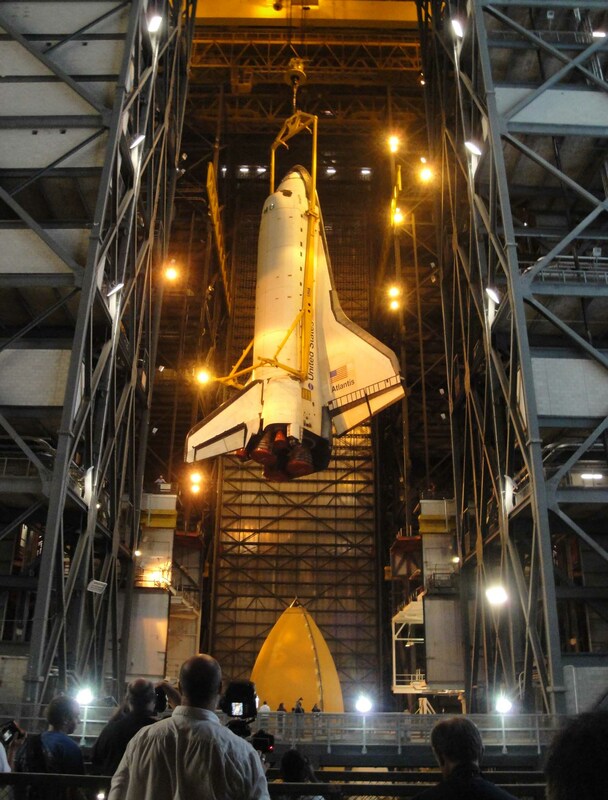 Once a vehicle is launched from Kennedy, control passes during the mission to Houston. 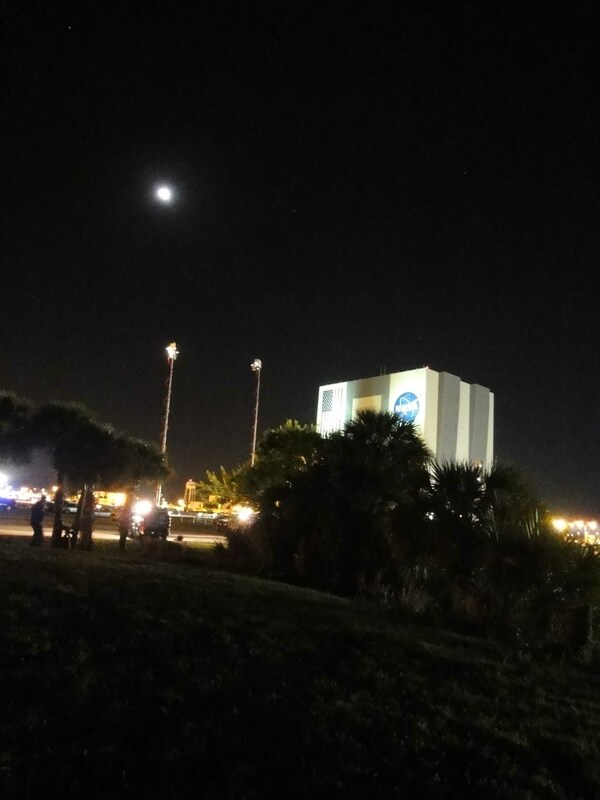 Photographers and reporters are bused by NASA to events at KSC and are only allowed unescorted to a lunch room a short walking distance from the Media Site. 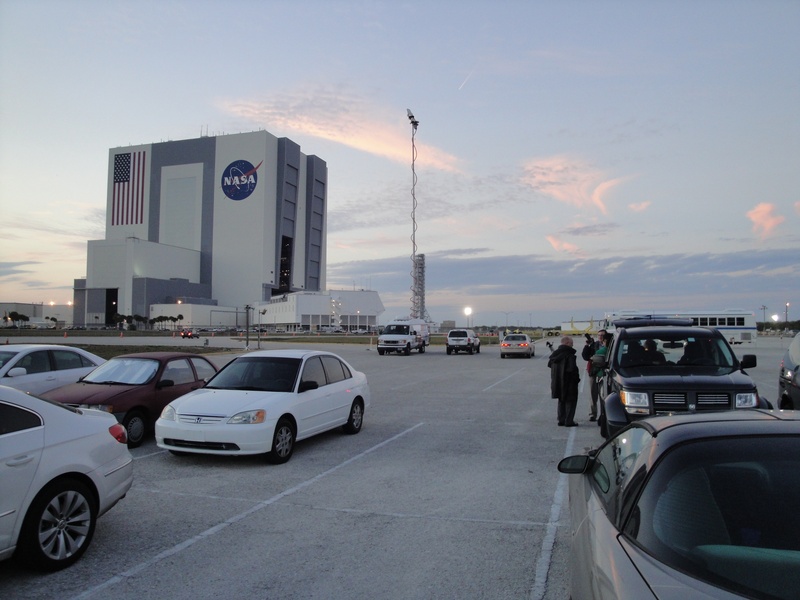 The 25-35 photographers covering the Roll Out of Discovery on January 31, 2011, gathered at dusk and waited for security to inspect their equipment before being allowed to board the bus which shuttled them across the street to the VAB. 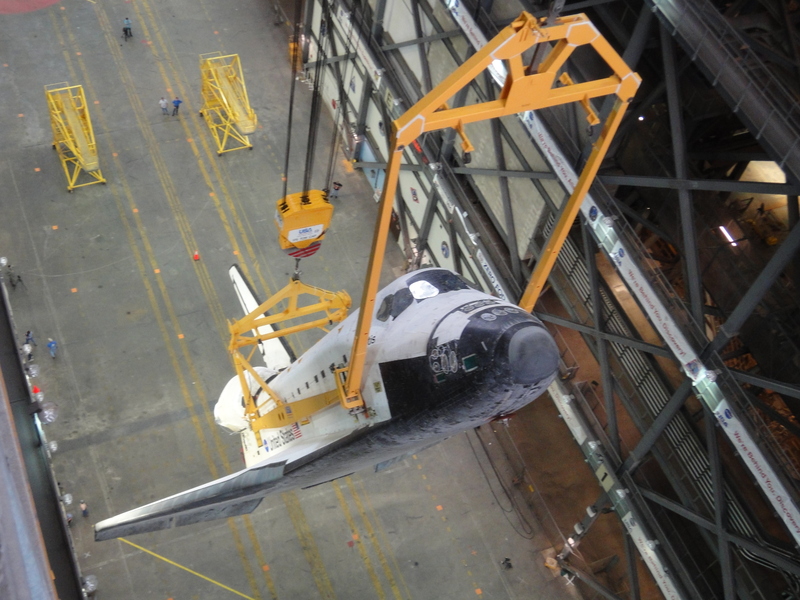 Yes, at the top center of this picture, you can see the bottom of the shuttle. Everything else is the crawler. 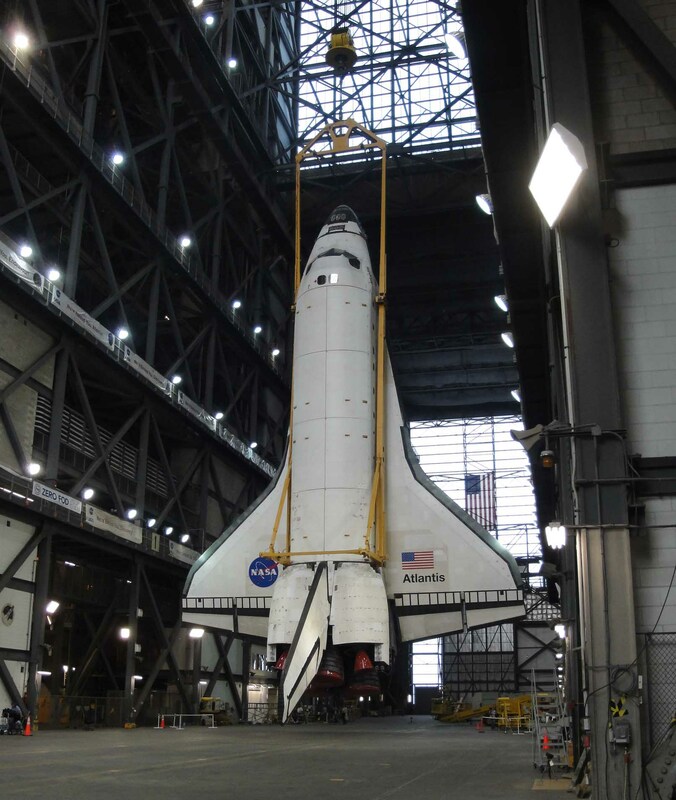 On the ground floor of the VAB the photographers walked past the Crawler with Discovery on top on their way to elevators which carried them to higher floors and better vantage points. Photographers had to surrender their cellphones and car keys -- anything which sends an electronic signal -- and, if they wore glasses, had to secure their glasses with bands to the backs of their heads before boarding the elevators. 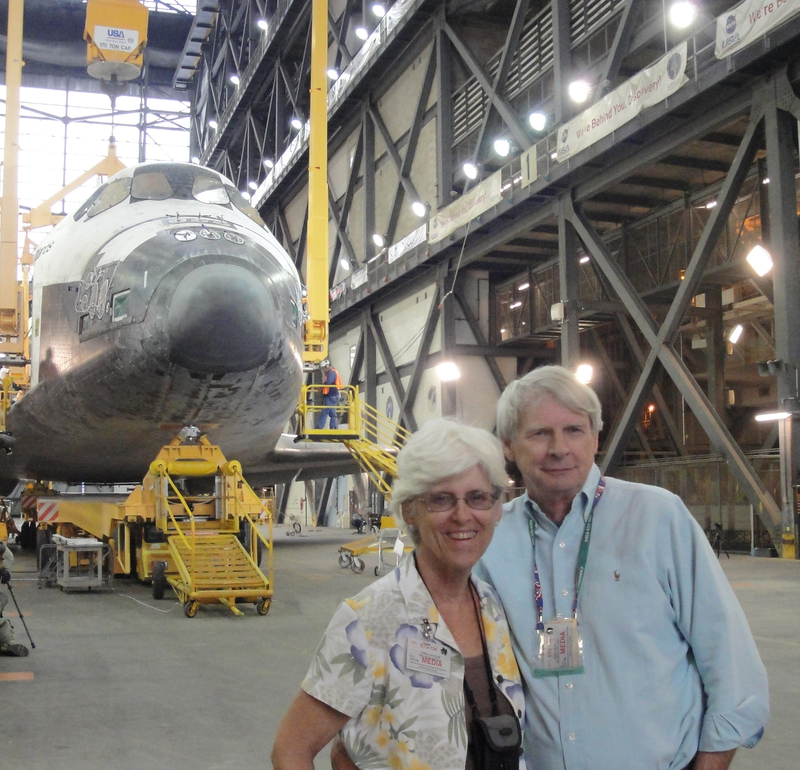 On the VAB's fifth floor, shown here, photographers were even with the top of the Crawler and the bottom of the shuttle Discovery. 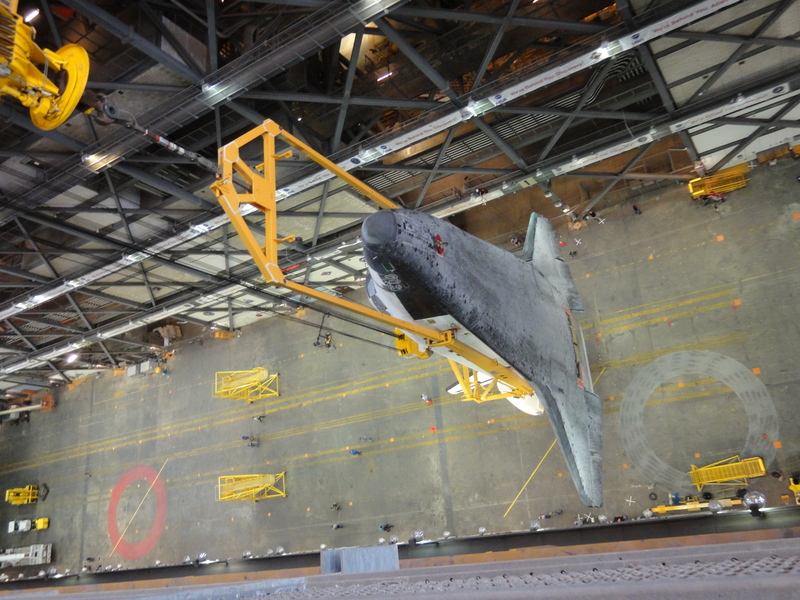 On the 16th floor they were even with the top of the main fuel tank. 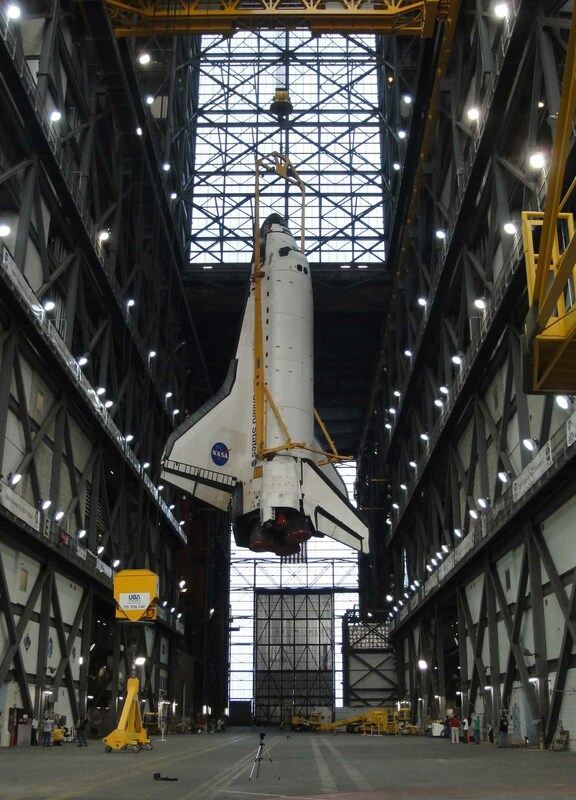 Photographers were free to move between these two floors as long as they were escorted and could walk within a few feet of the Crawler itself by going on walkways that led out over the VAB shuttle bay. 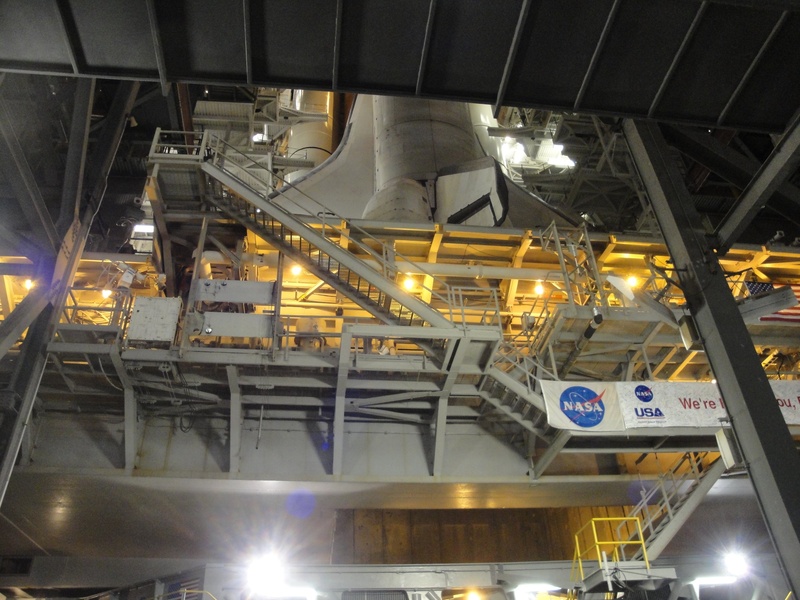 The tip of the main fuel tank is even with the 16th floor of the VAB. 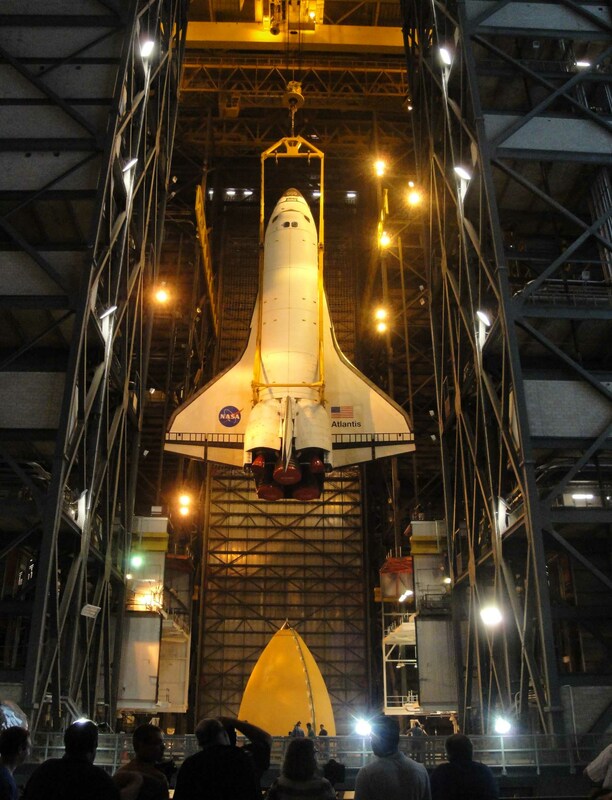 The VAB was built in 1966 for the Apollo Moon program which used much larger rockets. 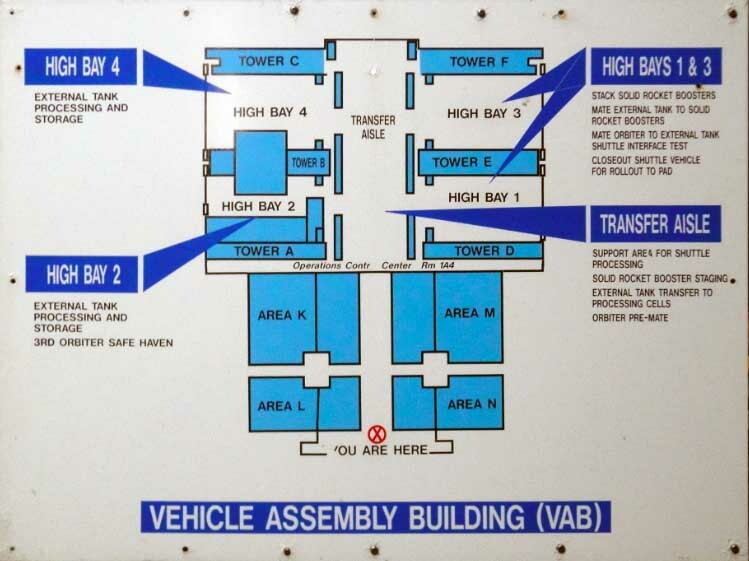 Although the shuttle and launcher only reach the 16th floor, the VAB itself continues on to the 37th floor, space that was needed in the 1960s and 1970s when NASA was sending missions to the Moon. 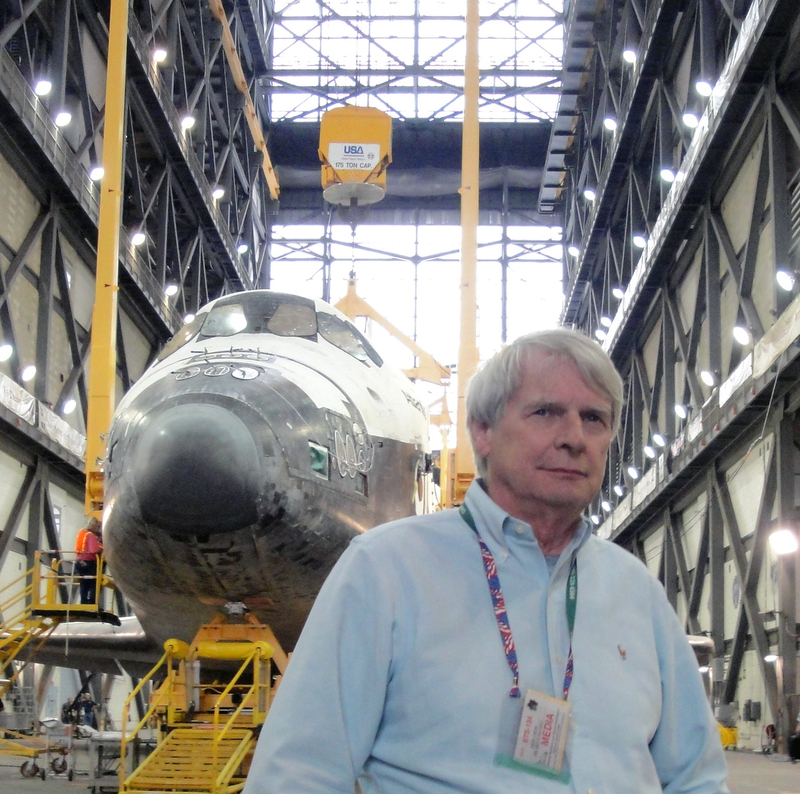 The final mission to the Moon was in December 1972 and men have not returned there since, although it is thought that the Chinese will be establishing a permanent base on the Moon within the next decade. Gone! 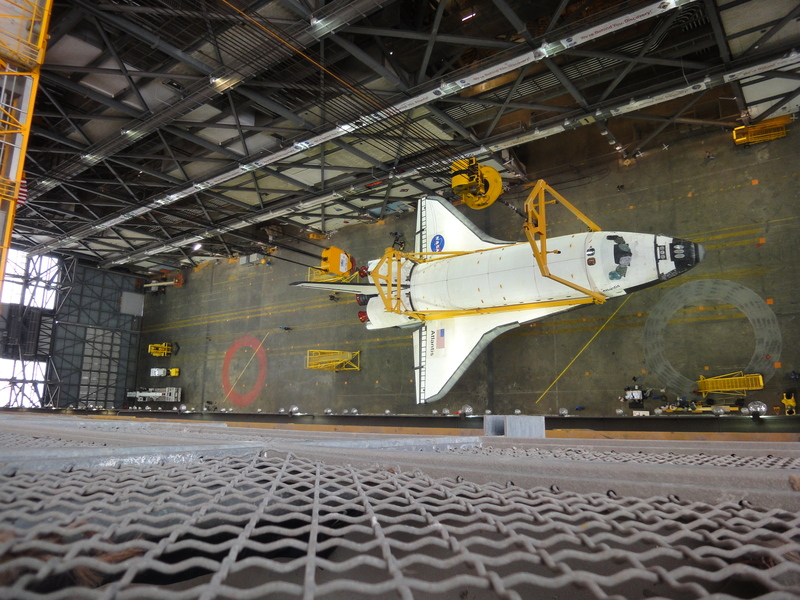 The well lit Crawler and shuttle are in the distance viewed from the now empty shuttle bay which a half hour before the Crawler and shuttle had filled. 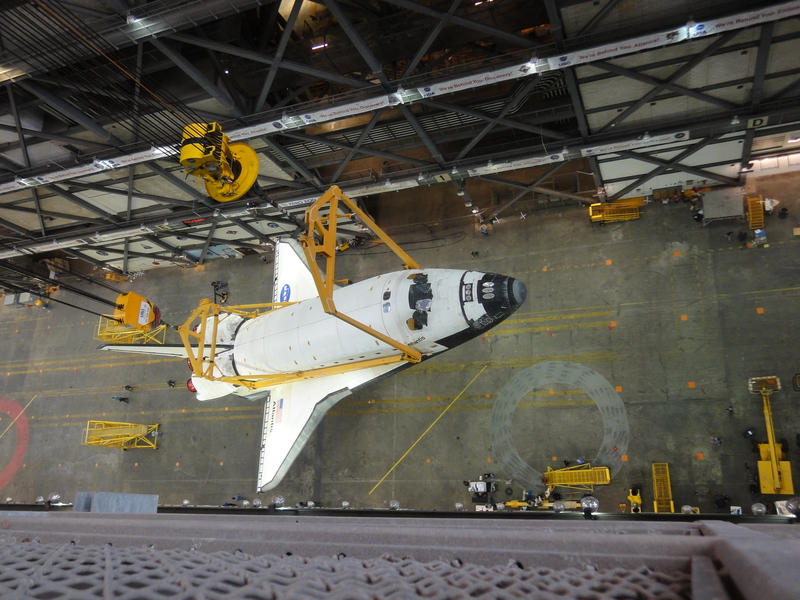 The Crawler does not move fast (1 mile per hour), but it is steady. If you wanted to drive the Crawler to California, it would take 125 days driving day and night. 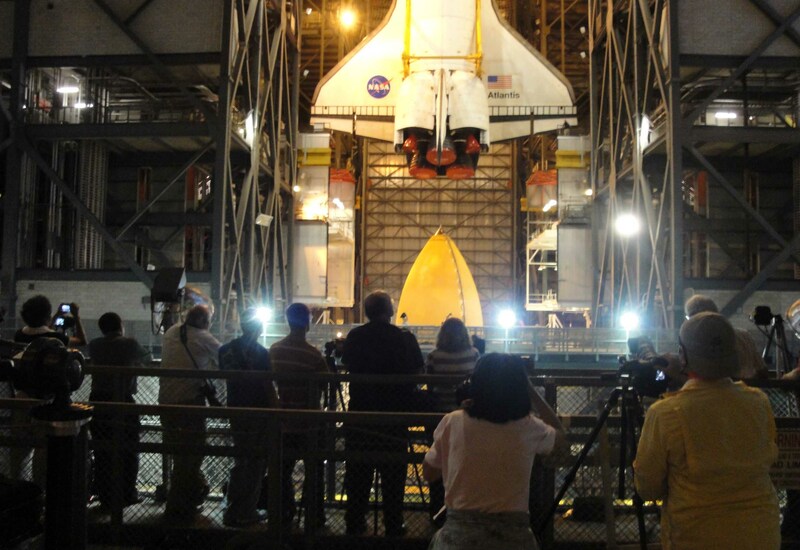 NASA varies the events it offers the press. 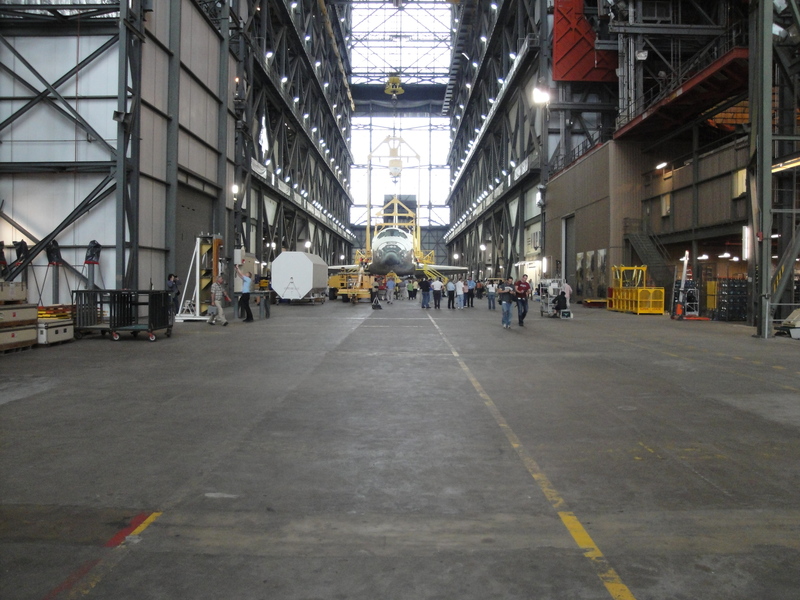 Besides periodic visits to the VAB, the Clean Room where shuttle missions are assembled, the astronaut dormitory and the launch pads, 39A and 39B, NASA also occasionally invites the media to walk the shuttle from the VAB to the launch pad or from the shuttle hangars to the VAB. 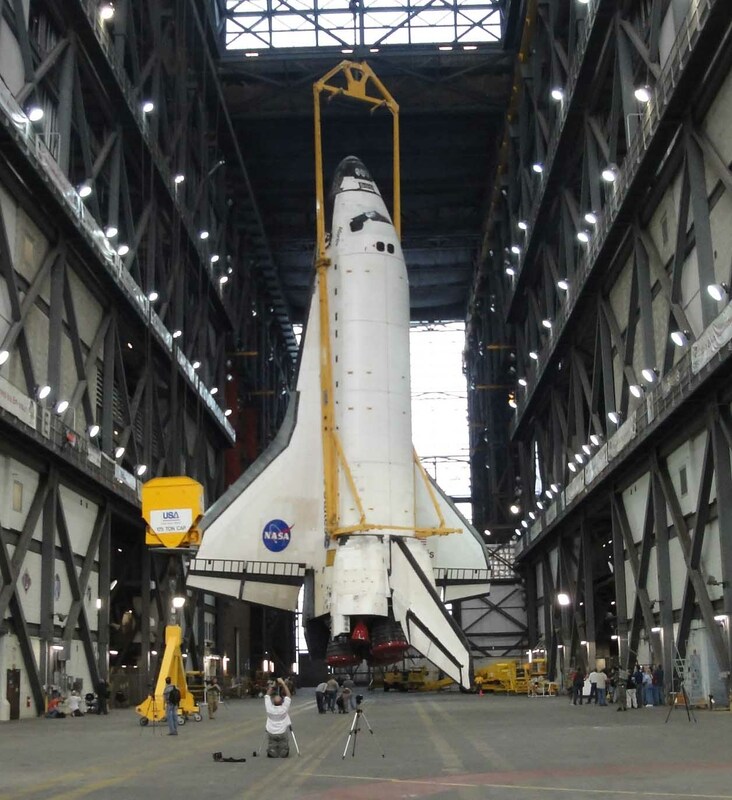 Only one more shuttle mission is scheduled before the program ends and the shuttles are sent to museums.